Despite the fact that Hindi-language Bollywood is often used as an umbrella term, Indian cinema is multitudinous, which is why Bollywood legend Amitabh Bachchan called the popular moniker into question at the Cannes Film Festival earlier this month. Indeed, Bachchan (“Big B”) has raised a good point. There are as many flavors of Indian movies as there are languages to drive the stories told in the Subcontinent’s films. The palate is larger-than-life: gods and goddesses, issues of caste and religious diversity, melodramatic tales of star-crossed lovers, and of course, song and dance. Without the life raft of genre categories to cling to, where does one begin? This is where we left off last time. Thanks the general internationalization of cinema and the attention drawn to Indian cinema this month on Bollywood’s 100th anniversary, Bachchan’s sentiment is catching on. To make this point clear, a quick summary of India’s cinematic history is in order. According to Majumdar, from this matrix emerged a number of classics, such as Do Bigha Zamin (directed by Bimal Roy), The Apu trilogy (Satyajit Ray), Mother India (Mehboob Khan), Awara and Shri 420 (Raj Kapoor), Saheb Biwi au Ghulam and Pyaasa (Guru Dutt), Meghe Dhaka Tara (Ritwik Ghatak), Sholay (Ramesh Sippy), Deewar (Yash CHopra), Amar Akbar Anthony (Manmohan Desai). If India’s overwhelmingly diverse cinematic history was boiled down into decade-long blocks of time, it would look something like this. In the beginning – 1913 to be precise – there was Raja Harishchandra (see above). Then came the advent of sound in films (“talkies”) in the 1930s. 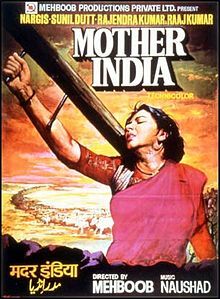 This major leap was followed by a series of breakthrough films in the 1940s and 1950s, including the landmark Hindi film, Mother India (1957). “All Hindi films come from Mother India,” Dudrah said. Moving on, Rajesh Khanna was a notable romantic hero of the 1960s, the “angry young man genre” of the 1970s (with a young Amitabh Bachchan at the helm). In the 1980s, Disco Dancer (1982), a rags-to-riches story of a street performer set against the backdrop of the disco era, and romantic drama Qayamat Se Qayamat Tak (translated as, From Doom to Doom, 1988) were blockbusters, while more familiar names in the West like Sharukh Khan began to emerge in the 1990s. Finally, in the 2000s, a new crop of directors began to make films with a more global sensibility. The second film on Dudrah’s starter list is 1995 romantic comedy Dilwale Dulhania Le Jayenge (aka DDLJ). DDLJ, voted India’s favorite film over the past 100 years, marks the entry of the diaspora on the film scene.